In the 19th century there were many individuals who could be considered larger than life, particularly in the United States. As well, there are many segments of our society thatshould be familiar with Thomas Francis Meagher, the subject of this biography, not the least of whom are the Irish who came here following the Great Hunger in the 1840s. Author Timothy Egan has written a biography that not only traces the life of his subject but also provides extensive context in the way of Irish history to better understand what made Meagher who he was: a rebel resisting the persecution and oppression of the Irish by the English over the course of several centuries. Egan details many of the laws, acts, and events by which this occurred and his hope for an eventual self-governing country. Thomas Francis Meagher (pronounced Mar) was one of those unique and unusual characters whose life can be defined or described in a multiplicity of ways: man of letters, orator, freedom fighter, revolutionary, soldier, statesman, and government official. Interestingly enough, Meagher was born in Ireland of considerably more means than many of his own people. He was able to attend exclusive schools yet became caught up in the struggle of the Irish against their English oppressors. Eventually banished (“transported”) for life to Tasmania for his political activities as the Hunger reached its apogee, Meagher was able to escape the island and land in the United States. Hailed as a hero by the Irish in this country, he was still a wanted fugitive, unable to return to Ireland. He turned his efforts in the 1850s to being a leader and symbol of Irish nationalism in the hope of leading a return to his native land to finally eject the English. As the United States descended into sectionalism, he became convinced that his adopted homeland should not suffer the moral degradation of slavery. Once the conflict had begun, Meagher led his countrymen into battle as a general at the head of what became one of the most renowned formations in the Union Army: The Irish Brigade. After the brigade was decimated at the Battle of Fredericksburg, Meagher resigned his commission but later served in the west, a period about which many know little or are not aware. Postwar, there was also a failed attempt at holding parts of Canada hostage to force concessions from the English, but it was poorly organized and supported with Meagher having nothing to do with it. With his fame and renown, Meagher was appointed de facto governor of the new Montana Territory where he butted heads with the so-called Committee of Vigilance, which enforced its own lawless version of law and order. As recounted by the author, the mystery of Meagher’s demise is still unresolved, although there was an effort in recent years to determine the cause of his death. Egan largely discounts any accidental cause or notion of suicide on Meagher’s part, believing that the Vigilantes were involved in murder. Meagher was eventually honored by the state of Montana with an equestrian statue in Helena. This is an easily read and informative book that will hold the reader’s interest, given the nature of its subject. If there is any criticism to be made, it would be that there are only a relatively few illustrations interspersed through the book. One would have hoped to see more. There are no footnote citations, and the endnotes force the reader to personally determine the source of information found within each chapter. As it is, the notes are essentially the bibliography as the book lacks a formal one. Otherwise, Timothy Eagan, a National Book Award winner, has combined his admirable writing style with his considerable grasp of not only his subject but also Ireland and the tragic travails of its people who now have their own Republic of Ireland, established in 1923. 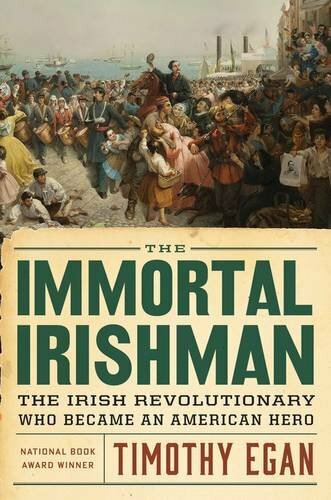 For those, Irish or not, interested in the proverbial rollicking good story, this book should be on one’s short list as Meagher was, again, one of those larger than life figures who easily packed more than most into one lifetime.